I am a writer. It feels funny typing that as I haven’t written consistently in a long time. Now that is changing. My latest insight is courtesy of Julia Cameron. I am slowly unblocking my seemingly eternal writer’s block with The Artist’s Way I am rediscovering the joy of writing. As I recall the bliss writing brought me as a child, a teen and even an adult, I realise, writing is my safety blanket. Without it there to settle me I may not go to sleep. When I haven’t been writing I’ve felt like something is missing. I’ve turned to things like partying or watching tv to numb that niggle. My memories of writing are paired with those of reading. As a child, I’d spend an entire Summer with my nose in a book, not even putting it down if I had to walk between rooms. I became a part of the stories I read, and their gift to me was to become a storyteller. Whilst I didn’t always value the gifts I was given, like the Barbie I was given in high school, thrown aside because I’m too old. I’d find the same thing happen with my stories, the little voice in my head would laugh at me, you’ll fail. So, back on the pile, my stories would go. I am a notorious book starter. Over the last few years, my attention span has been like that of a puppy and I have rarely finished books. At the start of the year, I set myself a reading challenge, that act itself has changed my reading habits. I’ve finished 8 and I’m not slowing down. I still jump from book to book, but now I actually wade from cover to cover with some of them. Baby steps. I’ve always loved reading, as I’ve grown older I’ve turned to nonfiction for sanctuary. I love collecting books and I am addicted to buying them. I like new books, but j‘adore old books. Their stories are not solely printed on the pages, they are imprinted on their weathered covers. If you’re lucky tucked inside their might be a bonus to let your imagination soar. 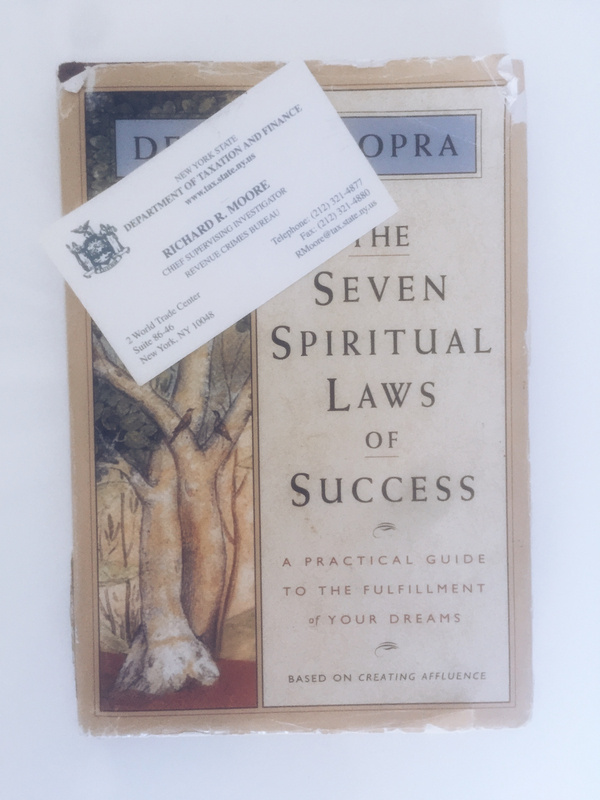 A few years ago I bought a secondhand copy of the Seven Spiritual Laws of Success it had a profound effect on me far beyond just the words on the page. Tucked inside it was a business card. It belonged to Richard R. Moore. He died 15 years ago, and although I know virtually nothing about him (I will keep wishing to find some connection to his story), every year on September 11 he enters my heart. I will always remember you. The magic of storytelling lives forever in me. Disclaimer: This article contains affiliate links to brands. If you make a purchase after clicking on one of our links, I may receive a commission at no extra cost to you. Thank you for your support. Mala Kennedy is a participant in the Amazon Services LLC Associates Program, an affiliate advertising program designed to provide a means for sites to earn advertising fees by advertising and linking to amazon.com, amazon.com.au, amazon.co.uk, amazon.ca. Amazon and the Amazon logo are trademarks of Amazon.com, Inc. or its affiliates.